TKB begins work on the Veterinary Teaching Hospital for Small Animals at the University of Illinois in Urbana Champaign. The work focuses on two primary functional areas, Surgery and Critical Care, and will include a building renovation and an addition. 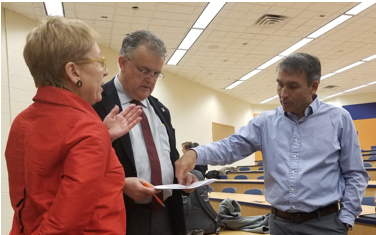 From left to right, Martha Bell, Principal of TKB, Dean Peter D. Constable of the UIUC College of Veterinary Medicine, and Tony Cochrane from TKB subconsultant Animal Arts discuss design potential following a preliminary project presentation.